Sales of bullion American Silver Eagles accelerated in the last half of September, more than doubling the number sold in the previous month. 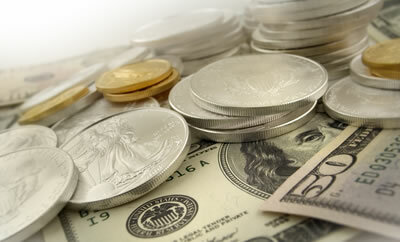 Demand for the silver coins surged as silver prices tumbled to lows not seen in over four and a half years. September sales of bullion American Silver Eagles ranked ninth highest for a month, dating back to the coin’s start in 1986. For the third quarter which ended with September, silver futures turned down a dismal 19%. The lion’s share of the loss happened this month as the market hemorrhaged $2.44 an ounce, or 12.5% of its value from the end of August. Silver for December delivery closed at $17.06 an ounce. It reached as low as $16.85, the weakest price since March 2010. Year-to-date, silver prices have dropped $2.31, or 11.94%. Gold for December delivery at $1,211.60 an ounce shed 5.9% for the month and 8.4% for the quarter. It is up 0.8% for the year. Platinum for January delivery at $1,300.50 an ounce fell 8.7% for the month, 12.3% for the quarter and 5.3% for the year. LBMA silver showed similar results at $17.11 an ounce, dropping for the month by $2.36, or 12.1%. Prices fell 18% in the third quarter and 12.3% on the year. Gold at $1,216.50 an ounce lost 5.4% for the month and 7.5% for the third quarter. Palladium at $775 an ounce fell 13.7% in September and 8.2% for the quarter. Platinum at $1,300 an ounce dropped 8.7% for the month and 12.2% in the third quarter. Year-to-date has gold down 12.3%, palladium up 9% and platinum down 4.3%. Investors flocked to bullion American Silver Eagles, driving sales in September to numbers not seen since March. September sales of 4,140,000 coins more than doubled the 2,007,500 sold in August. This month marked the second best September, behind September 2011 sales of 4,460,500. More pointed, the month also ranks ninth highest since the series debuted in 1986. The table below shows the top ten sales months for the 99.9% pure silver coins. Year-to-date, the United States Mint has recorded American Silver Eagle coin sales of 32,251,000. This year already ranks as the fifth best year ever for the program. To top the chart, however, more than 10.4 million more will have to be sold in the next three months. Doing so would drive past last year’s record total of 42,675,000. The 2014 Everglades National Park 5 Ounce Silver Coin is expected to launch in November. Collectors and investors also sometimes hold significant numbers of common U.S. silver coins because of their intrinsic melt values. These coins have varying percentages of silver in them. As such, associated melt values of the coins fluctuate in direct correlation with the silver market. The melt values above are based on the London price for silver at the end of August and September of 2014.